my husband is enthralled with this watch which i gave him for our anniversary/christmas present. it is unique and eyecatching and gets lots of compliments. In my lifetime, I have owned scores of very nice watches. Never have any of them captured people''s attention the way this Graves 33 does. The number of complications impresses even my friends with Rolexes and Tag Hauers. Stauer has truly recreated a legend in high quality for a reasonable price. I purchased this watch two years ago...awesome! Never had any trouble, I get a ton of compliments (people think its really expensive) and I can say enough about its form and function!! I''ll be a long time customer with this company! !Thanks Stauer!! The first day i wore this watch to work I received quite a few very nice compliments on the watch. Most people wondered where I had purchased it from because they had not seen anything like it. I told them to check out your website. I really love this watch. It really compliments the man. The first day i wore this watch to work I received quite a few very nice compliments on the watch. Most people wondered where I had purchased it from because they had not seen anything like it. I told them to check out your website. I really love this watch. I purchased this watch and have been using it for 2 weeks now. IT IS GREAT, no problem at all. You can''t ask for more for this price. I am very happy with it. I will write another review after some months to let you know what is going on. But today I have to say: Don''t be afraid of buying a Stauer because it says &quot;China Movement&quot;. Great Watch for its Price! I love watches, the only jewelry I wear. Wow, this watch beats them all, including watches I own at 10 times the price. From the blue jewel hands including the smooth sweep second hand to the ivory face, it''s a classic. Brings wow''s from anyone who notices it. It''s definitely a five star rating from me. Thanks Stauer. Your match is very special in it''s look. The watch face has a nice classic design, reminiscent of certain more luxurious brands, and the crocodile leather band is an elegant touch. The watch keeps good time as well.However, it is rather fragile. It quit working after accidentally dropping on a thick-carpeted floor. A local watchmaker was able to fix it, and he commented negatively on the quality of the movement.Additionally, the watch band wears out rather quickly, and the placement of the push-buttons makes it easy to inadvertently press them.This is good to wear as a dress watch on special occasions, rather than for everyday purposes. I originaly had the 1922 tachymeter automatic watch since 2006, nice watch, I was a little skeptical about he durability of this watch. It has taken some hard Knocks, bumps, scrapes but still looks brand new and keeps perfect time, but on the + side.Because of that I purchased the Graves 33, and find myself admiring it more than checking the time, the blue hands and gold rims sparkle at the same time and catch everyones attention or admiration. The only negative thing I have with this watch is, if I keep it in a watch winder it looses 15 to 20 seconds in a 48 hour period (have not tried faster settings) if I wear the watch it will loose a couple of seconds in that time period and in some cases speeds up. Which is perfectly acceptable for an automatic watch as the time averages out for precision, rather than quartz or digital accuracy, once positive or negative remain in that direction. Plan on keeping as long as I can, now I-eeng the steel noire. I needed an everyday watch because I wanted to save my Tag for special occasions. So far this watch is pretty cool. Great look. t seems to work great. Compared to the Tag it is considerably lighter but it seems to do what it promises. All in all for the price I am pleased. My tag cost over $3000 this cost $149... But I realize that the quality is not that of a handmade Swiss watch. That''s ok I still like thus far. I will report back after a month a let you know how its holding up. I withhold the 5 stars because the verdict is still out. 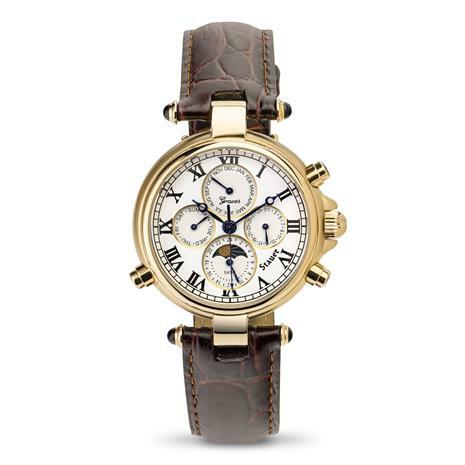 I have just purchased this watch and I would like to make it publicly known that I have divorced by wife because of it. It''s face, so much more pleasing to look at than my dumpy sack of an ex-wife. It''s precision, it''s tiny jewelled hands, it''s ''been in Magaluf'' tanned strap. I want it to marry me. Thank you. Business Week stated it best... “It’s the complications that can have the biggest impact on price.” It never needs batteries and never needs to be manually wound. And the watch is tough enough to stay water resistant to 5 ATMs. You can now wear a millionaire’s watch but still keep your millions in your vest pocket. What an Anniversary gift!! Nuff said..
Great looking watch! Took my breath away when I opened the box. Thrilled with the quality and value. First I bought the gold watch and I liked the look of it so much that I then purchased the silver one. Both are outstanding. I've often been asked where I got such a beautiful watch. It's fun to tell people the fascinating history of this watch. Everything is good about this watch, except the y don't sell the wrist band to have a second pair. I have had other of the same watch and I have to purchase a second watch because I can't find this type of band, in order to use both of them. They should change this policy. This is my third watch from Stauer. I'm just as excited about it as the first two. Even my coworkers are starting to notice. I really love this watch. I admired it for years and I was thrilled when I received it as a gift. There is one issue with it however. Because of the unique way the watchband attaches to the watch itself I have found it impossible to locate a replacement watchband. Staue doesn't have them and I can't find them anywhere on the internet. The band on my "Graves" watch is wearing out and it will soon be necessary to find a new one. If I can't find one I may not be able to wear this beautiful watch. It seems like Stauer should have a supply of these unusual watchbands, after all, they sold an unusually designed watch and they should be responsible to supply all the accessories that allow you to wear it. 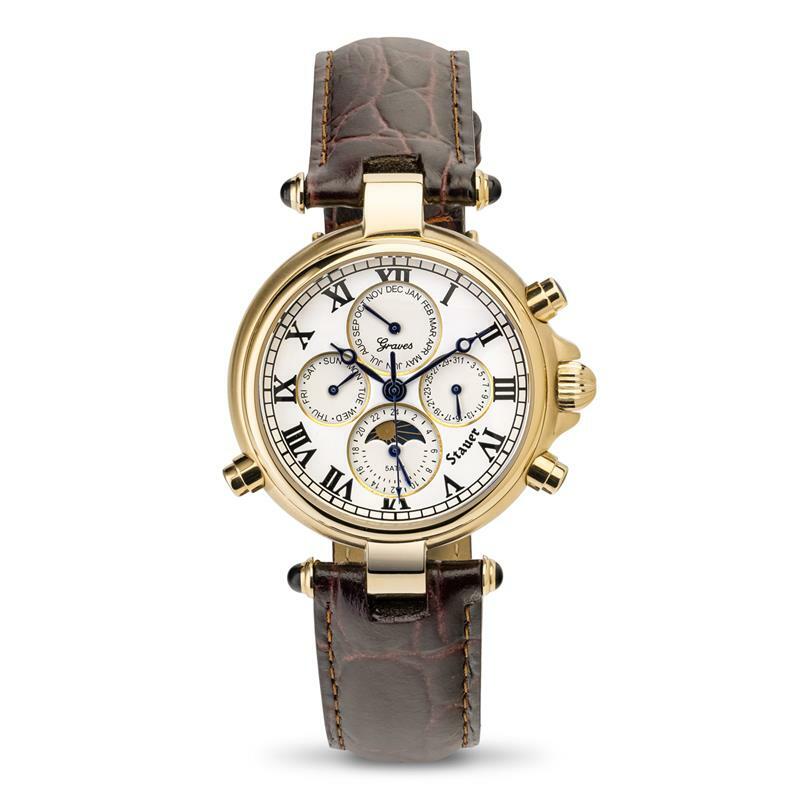 As I said, I really love this watch but I'm afraid that Stauer has dropped the ball with regard to a lack of foresight by not realizing that this need would eventually come up. It's made me reluctant to purchase anything else from them. Manufacturers should stock replacement parts. Graves '33 Watch A hit! I purchased this watch for a friend, as a Thank you. They were blown away, and kept saying, "This is beautiful, I've never had a watch this nice." Needless to say, it was a big hit! I easily set it for him, and he put it right on. A week later, they're still raving about how many compliments he gets from other men who see this. I can't believe how fast it arrived, and how exceptional it looks. I've purchased this years ago for another friend who also loved it. Has the world's most valuable timepiece disappeared forever? Back in 1933, the single most important watch ever built was engineered for a quiet millionaire collector named Henry Graves. It took over eight years and the most advanced horological techniques to create the multifunction masterpiece. Decades later, when the ultra-rare innovation was auctioned off in 1999, it sold for the record price of $11m and in recent years has been on display in a Geneva museum. However, the watch recently returned to the auction block selling at a new record price of $24,128,000 to an anonymous bidder. Will this masterpiece slip away into a private collection only to be enjoyed by the privileged few? We believe that a classic like this should be available to true watch aficionados, so Stauer replicated the Graves design in the limited edition Stauer Graves '33 Wristwatch. The antique enameled face and Breguet hands are inspired by the original. But the real beauty of this watch is on the inside. Stauer replicated an extremely complicated automatic movement with 27 jewels and seven hands. There are 210 individual parts that are assembled entirely by hand and then tested for over 15 days on Swiss calibrators to ensure accuracy. Each Stauer Graves '33 watch is then re-inspected in the United States upon its arrival. What makes rare watches rare? Business Week stated it best... "It's the complications that can have the biggest impact on price." (July, 2003). The four interior complications on our Graves watch display the month, day and date, while the 24-hour clock graphically depicts the sun and the moon. The innovative engine for this timepiece is powered by the movement of the body as the automatic rotor winds the mainspring. It never needs batteries and never needs to be manually wound. The precision-crafted gears are "lubricated" by 27 rubies that give the hands a smooth sweeping movement. We've done the unthinkable. Not only have we emulated this stunning watch of the 1930s but we've been able to build this luxury timepiece for a spectacular price. Many fine 27-jewel automatics on the market today are priced well over $2,000 dollars, but you can enter the rarified world of fine watch collecting for much less. You can now wear a millionaire's watch but still keep your millions in your vest pocket. Fits wrists 6 ½"”9".